This class can be used to perform searches and retrieve results from Google. It can send HTTP requests to the Google search pages to perform searches for given keywords. It retrieves a single page of results. The number of pages and the number of results per page can be configured. The class uses randomly selected proxy-servers such that Google certainly won't black-list you, decrease your pagerank or whatever and the searches get better anonymization. -Integrate it into your website (use &#8220;site: blablabla.com&#8221; in the query). -Playing around with Google-results, you want to analyze, compare, check Google's results? Create a script using the results provided by this class. 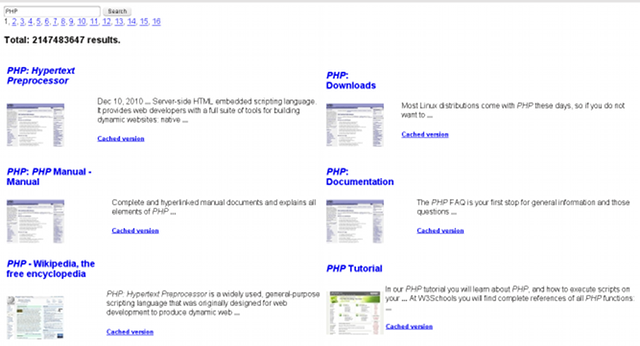 -Install it locally or on your webspace to get a nice Google-interface with more anonymity. This package is VERY VERT Useful for me. looks like a weak implementation.